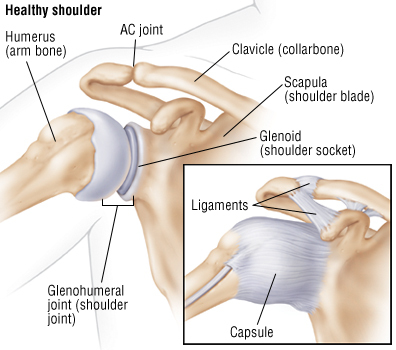 The shoulder joint is called a ball-and-socket joint. The ball is the rounded top of the bone in the upper arm (humerus), which fits into the socket — the cup-shaped outer part of the shoulder blade. When the top of the humerus moves out of its usual location in the shoulder joint, the shoulder is said to be dislocated. A related injury called a shoulder subluxation occurs when the top of the humerus is only partially displaced and not totally out of its socket.